Part of the Plan is a proposed interview series about process where D. Bethel talks to creative people of all media about how they make their work. It’s an investigation into the process of creativity that threads together the spectrum of all creative people from popular culture to strict academia. It’s a celebration and critical investigation into how people make stuff. 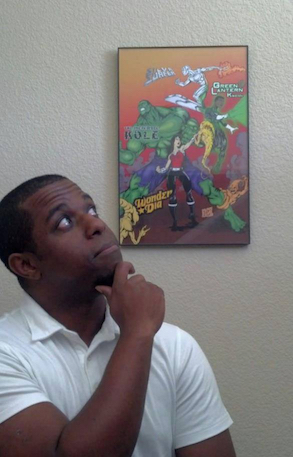 Shaman’s Destiny creator, Kyrun Silva, loves comics absolutely. I’ve said it before, but with as cynical as I can get, especially with superhero comics, Kyrun can show up and all of a sudden, I’m talking about ’90s X-Men and early Image Comics work (like WildC.A.T.s, Deathblow, Youngblood, and Spawn) with as much vigor as I had when I was neck-deep in it as a teenager. Kyrun is able to bring any of your latent fandom out and elevates your current fandom to new heights, his passion for the form is infectious and toxic (in a good way). By the time we finished the hour-long session to record his interview, I was well and ready to record another hour solely talking about ’90s comics (and we’ll get to it eventually, but probably for my weekly nerd discussion podcast). Kyrun Silva. Creator of Shaman’s Destiny and founder of Big Tree Comics. His book, Shaman’s Destiny, is Kyrun’s spin on the format and stories he has loved since he was a child, and the passion breaks through in the layouts and art of the book. There’s a deep reverence for the characters and the story they play a part in. It is almost a metanarrative––it’s like these characters know they’re in a comic and wholly respect the job they’ve been tasked to do and do so in as epic a style as possible. It’s funny that Rob Liefeld is Kyrun’s favorite artist because Liefeld is the person of whom Kyrun reminds me the most. Say what you want about Liefeld––and I’ve certainly said things––the dude is not only one of the most famous (and infamous) comic creators of all time, but through all of his years writing and drawing comics and all the ups and downs he has experienced, Liefeld is still a super fan. He loves comics and even if you have nothing but vitriol for his art and business practices, to a point where you actually have personal feelings about him as a person, I dare you to watch an interview with Liefeld and smile. He loves comics and is still so exhaustingly jazzed about them. So pumped is he about the medium that your fires naturally get stoked, too. Kyrun has that same energy and passion and it’s fantastic to be around. If there’s anything I learned about how Kyrun makes comics during the talk I had about the process with him, is that he trusts that passion and love for the medium and it guides his hand from pencil to ink to print. Cover for Shaman’s Destiny #5. Art by Kyrun Silva and Michael Dorman. Check out the Kickstarter campaign to collect the series as a trade paperback collection. 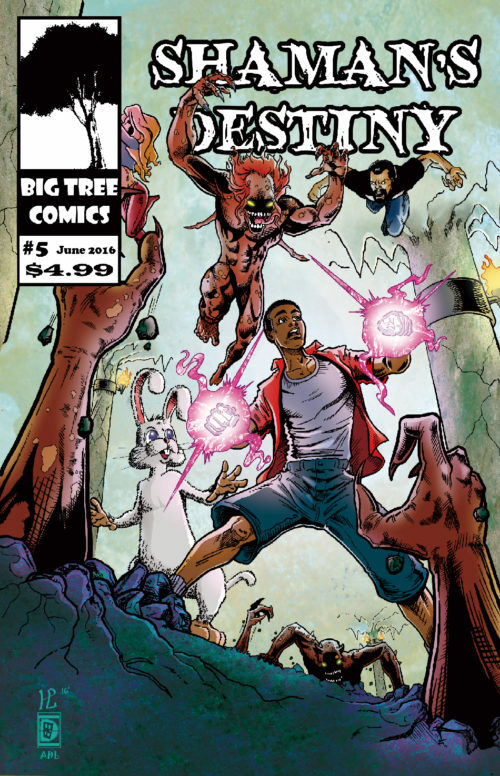 Be sure to check out his Kickstarter campaign to collect all six issues of Shaman’s Destiny in to a trade paperback collection (I think I have a pinup of the main character, Malik, in issue #5) at btcreates.com before it ends on March 31. A pledge of $20 gets you a physical copy of the trade itself. Thanks again to Kyrun for letting me test out this idea on him. If more Part of the Plan interviews get made, the structure may change and bend as I figure out exactly what I want it to be, but even in this primordial stage a lot of good stuff came out of the conversation and I couldn’t have had a better first subject for this potential series. Once I get my bearings to the point where I can have fun conversation and probe even deeper into interesting thoughts and issues, I’d love to bring Kyrun back for a round 2 (and, ultimately, that talk about ’90s comics! ).